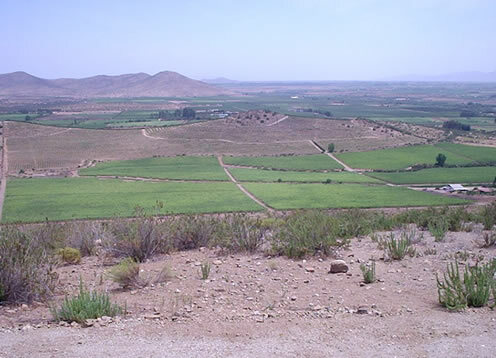 AguaTierra vineyard is located in Ciénago, near Punitaqui, which is 25 kilometers from Ovalle Limari Valley in the Region of Coquimbo. It belongs to the Agricultural Society AguaTierra Ltda., Who began this adventure to produce organic wines 1999, with all certified organically from March 2004 production. AguaTierra has waited the best time to exit the market because it is targeting a segment that values the organic production and profits. The area has the cleanest soils in the country, and these are added to natural conditions of production, in which native flowers, planted among the vines, to attract and control insects, presenting excellent results are used. Handling is without chemicals and artificial products. Punitaqui bet to become the cleanest area of the world to cultivate organic grapes, due to the lack of rain, excellent solar radiation.